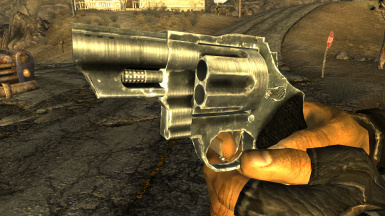 This mod adds a compact variant of the .44 Magnum Revolver to the game, using a custom mesh. I started with the base game .44 Magnum Revolver mesh and modified it into my ultimate snub nose configuration. The barrel has been shortened and ported to reduce muzzle climb, the hammer is bobbed to prevent snagging (but thereby rendering the gun double-action only), and while the sights were removed to lower the profile, a V-notch has been milled into the top of the frame to act as a rudimentary sighting system. Lastly, the grip has been cut down to reduce size and weight. 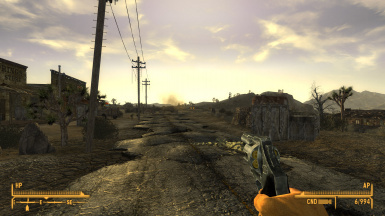 Gameplay-wise, this weapon's stats were cloned from the .44 Magnum Revolver, though with a lighter weight, smaller spread and higher rate of fire (50% faster). 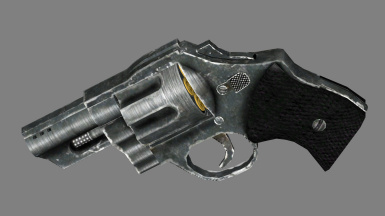 It can't be modded, but I've added the weapon to all the appropriate form lists, so that all perks and challenges that affect revolvers. such as The Professional, Cowboy and Old Vaquero, will work as expected. 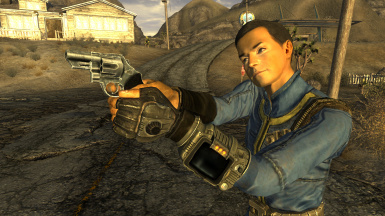 The gun is considered a holdout weapon and can be smuggled into casinos without a skill check. 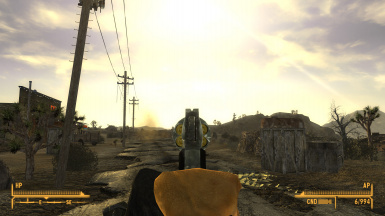 There is also an optional alternate plugin that makes the weapon 15% smaller and chambered in .357 Magnum for less damage but wider ammo availability. Both plugins can be used at the same time to add both weapons to your game, if so desired. The grips use the Police Pistol textures from the Dead Money DLC, but I've provided an alternate base-game only compatible mesh if you don't have the DLC.